Wish that I was there to play and greet and meet. I know that all of you will have a great time with her and at the show. We are doing the final "getting it together" for Black Sheep, packing will begin soon and then tomorrow off to set-up. Oh...my...gawad...love the new configuration. You and I need to talk about something that looks like the ocean at Crystal Cove, Laguna Beach. :-) Sheila, you just amaze me! P.S. Ask Angela or someone how to enable the feature where we have to enter the displayed character string, it will keep spam away. Thanks to all of you who posted. It's so heartwarming to get this type of response to what we put our heart into. Life is full and for you to take the time to respond with all of the support that you have sent makes me VERY happy!! And, ofcourse, eggs me on. Caroline and Angela your help with the word verification is truly appreciated!! Just popped by to say hello and welcome to the blogisphere! 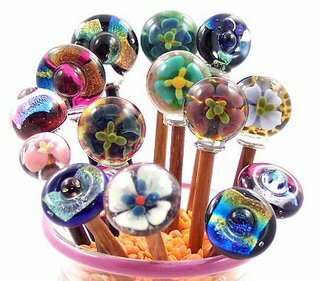 Your shawl pins are lovely. The jug of shawl pins looks like a garden in the sunlight. I love love love them! I'll keep growing my hair out so that I can jam a shawl pin/hair stick in there and show off your talent. Have a great great weekend and sell out. Just gorgeous Sheila! My hair is definately too short for hair pins, but I sure do like the shawl pins! I'll see you before you read this (probably) but congrats on the new blog! Wow..I feel so honored. Thanks to you all. Lisa, have a great trip!! How do you post pictures onto your comments? You guys are amazing!! I love it! Our cat Smerm wants a picture of her own NOW! !